With the Oscars happening tomorrow and the 2017 awards season coming to a close, I decided to do my own annual awards round-up type of a post. Like I did last year (2016 round-up), I have combined the nominees from the various awards shows. Although the Oscar nominees make up the basis for all the categories, I have also added nominees from the Golden Globes, the Critics Choice Awards, the BAFTAs and the various guild awards (SAG, DGA, PGA, WGA) that the Academy overlooked. I allowed myself up to 10 nominees in every category except the best picture one – it was expanded to 12. I have not only noted my personal winners in each category but I also ranked all the runner-ups. Below, I have also written down my guesses of who will actually win an Academy Award in each category, because my subjective preferences not necessarily fit my more objective picks. Lastly, all the full reviews of the movies have also been linked. The objective pick: While I’d be very happy if any of my top 3 films win the big award of the night, neither of them will. Best Picture will probably go to La La Land. Moonlight is my other guess. The objective pick: the top three frontrunners for the award are Affleck, Gosling, and Washington. Gosling would be my choice because of the wide variety of skills required for his particular role (playing piano, dancing, and singing on top of acting). The objective pick: My personal winners – Huppert, Portman, and Stone – are the frontrunners for the Oscar. Stone will most likely take it even though Huppert does have a chance of stealing it. Portman deserves the win as well but she already has an Oscar. The objective pick: Ali should win this one. Patel, coming off of BAFTA win, might prove to be a legit competitor. Bridges or Hedges could also possibly steal the win. The objective pick: this is one of the two categories, where my subjective and objective choices are one and the same. Davis has won all the important awards up until now and it is obviously her time to finally get an Oscar. The objective pick: the other category, where the objective and subjective winners coincide. Chazelle did a great job directing La La Land and, even if the film wasn’t my favorite of the year, his excellent work should be rewarded. The objective pick: La La Land has won a few screenwriting awards but, if it wins the Academy Award, I will be furious. The story was the weakest part of the film and I’ll, genuinely, be happy if any other picture wins. The objective pick: This category has the most equal race. Honestly, any nominated film deserves it. The Academy might give this win to Hidden Figures as they probably not gonna give it any other awards. The objective pick: I haven’t seen the 2 indie picture that were nominated but, that doesn’t really matter because Zootopia will take the win, as it should. I hope you enjoyed flicking through my list of winners. Are you planning on watching the big show tomorrow or are you just gonna check who wins online, like I’m planning to do? Welcome to a review of a movie that would have been on my Top 10 films of 2016 if I have seen it before the end of the year (when will the studios realize the benefits of the global day-in-day releases?). This is Hidden Figures! IMDb summary: Based on a true story. A team of African-American women provide NASA with important mathematical data needed to launch the program’s first successful space missions. Similarly to Loving and Fences, Hidden Figures is a different kind of movie that spotlights the African-American talent. It’s set during the civil rights movements but doesn’t directly relate to it, even if some of the movement’s ideas are addressed in the film in a really powerful way. This movie also stands out as one of the major female-driven films of the awards season. It has been praised by critics but most importantly it managed to debut at the top of the box office list in the US, meaning that a lot of mainstream moviegoers saw it! Hidden Figures was written by Allison Schroeder and the director of the picture Theodore Melfi, based on the book of the same name by Margot Lee Shetterly. I absolutely adored the film’s story. I knew about Katherine Goble Johnson before seeing the film (thank you, SciShow on Youtube) but I loved getting to know more about her as well as other African-American women working at NASA. I immensely enjoyed seeing all the different parts of NASA (the 3 of them worked in different departments – calculations, engineering, and computing) and the space race through their distinct perspective. It was actually really interesting to finally see a Cold War movie that didn’t focus on the local conflicts in Vietnam, Korea or Berlin, but a one which looked at the more passive but no less interesting space race. In addition, I liked that not only the professional but also the private lives of the 3 main characters were presented. This made them all into more well-rounded and realistic characters. Hidden Figures’ writing also focused a lot on the importance of education, portraying it as a key to a better life. I have always been a strong believer of this statement, so the film automatically appealed to me. It was also quite cool that the picture underlined the importance of mathematics, as it is usually the most hated subjects in school (I actually quite liked it). The film’s story, even though set in 1960s, was also contemporary and very topical, if you think about its possible relation to the Women in STEM program. Lastly, Hidden Figures tackled all kinds of discrimination, mainly sexism and racism but also general discrimination in the work place. Even though half a century has passed, all of these types of bullying are still happening today and should be stopped. Hidden Figures contributes to this conversation by a lot. And even though the film deals with serious topics, it still ends on a positive note and has a very satisfying ending. Katherine, Dorothy, and Mary are not just heroes to all girls or African-Americans. They should be idols to all underdogs and, let’s be frank, we are all underdogs in one field or another. Hidden Figures was directed by Theodore Melfi and he did a superb job with his 2nd feature (St.Vincent was his directorial debut). The movie was balanced and well-paced, both entertaining and intellectually engaging. It was compelling, suspenseful, and intense and these feelings were only strengthened by the fact that it told a real and not a fictional story. The picture had a few very powerful scenes, like Taraji P.Henson’s character’s speech about the bathroom discrimination as well as Janelle Monáe’s courtroom speech. The film also has a few more personal and touching moments to counteract the powerful and serious scenes, like Mahershala Ali’s character’s proposal to Taraji P. Henson character. Hidden Figures also had a magnificent soundtrack by Hans Zimmer, Pharrell Williams (he also produced the film), and Benjamin Wallfisch. It was upbeat and fun and really helped to lighten up the serious mood of the picture. When watching the film, I didn’t know who composed the movie’s music, but now, seeing who was involved, I’m not at all surprised that I liked the soundtrack. I mean, Hans Zimmer and Pharrell Williams!? Such a great combo of class and pop! The three leading ladies of the film were played by Taraji P.Henson (Empire), Octavia Spencer (The Help, Snowpiercer, Zootopia, Divergent) and the newcomer Janelle Monáe. I absolutely loved the individual performances of all the actresses as well as their chemistry in the group scenes. In my mind, the cast is the film’s strongest element so it is not surprising that the movie received a lot of SAG nominations. Octavia Spencer has been getting the majority of the recognition but I would have preferred if they would have spotlighted Taraji P. Henson in the lead actress category instead. Spencer already had her big win with The Help and, more importantly, I thought that Henson’s performance was stronger. If the voters wanted to only reward the film’s in the supporting actress category (like they are doing now), Janelle Monáe should have received a nomination instead of Octavia Spencer. Monáe is a true breakout star of 2016, as she was also in Moonlight. Don’t get me wrong, Spencer was great too but it would have just been nice to reward the other two actresses as well or instead. The picture also has a splendid array of secondary characters who were brought to life by great actors. Big Bang Theory’s Jim Parsons played a familiar role (he can’t seem to escape the nerdy scientist part) and did a great job. His character was the one that bullied Katherine the most, but I think that he would have been jealous of anyone. Sadly, Katherine’s gender and skin color made her an easy target. Kirsten Dunst (Midnight Special) also played a part in the film and had an amazing line that just summed up the movie perfectly. I, of course, mean her statement about how the USA are fast to space but slow when it comes to the progress on the ground. Mahershala Ali, who was in Moonlight too, also had a small role and did a nice job. The mainstream audiences know him best from Luke Cage, so his career, both the mainstream and the indie parts of it, are on the rise. Lastly, even Kevin Costner (Draft Day, McFarland, USA) delivered his best and the most interesting performance in years. In short, Hidden Figures was an excellent film that told an important and fascinating story but did that in an entertaining way. The movie was really well-made behind the scenes and it also had the best on-screen ensemble I’ve seen in a couple of years. Sorry for not writing for more than a week. I was really busy with university work and midterm assignments. But since it’s the weekend, I have a little bit of time to give you my thoughts on The Divergent Series: Allegiant! I swear the names of these films just keep getting longer and longer. Thank God that this one doesn’t have ‘Part 1’ in its name, though. IMDb summary: After the earth-shattering revelations of Insurgent, Tris must escape with Four beyond the wall that encircles Chicago to finally discover the shocking truth of what lies behind it. While watching this film, I came to the conclusion that I might have grown out of these dystopian movies or, at least, moved on to a different phase in my life. I also don’t think that I am the only one who did that: I would be really interested to know how financially successful this movie will be and whether the mainstream audiences are still interested in this genre of YA science fiction. But then again, there are only 3 (or only 2, since THG has ended) of dystopian franchises left, while there are more than 10 different comic book series and those movies are always profitable, despite how oversaturated the market is. The script for this film was written by a whole bunch of people: Noah Oppenheim, Adam Cooper, Bill Collage, and Stephen Chbosky. It was, of course, based on the book by Veronica Roth. Chbosky is the one person from this group whose work I am familiar with. He, of course, wrote the book and the screen version of The Perks of Being a Wallflower and he also directed that film. That narrative is one of my favorite coming-of-age stories ever. Chobsky is also writing a script for next year’s Beauty and the Beast for Disney’s live action fairytale department. Meanwhile, Oppenheim has worked in the genre of dystopian fiction before – he was one of the screenwriters on The Maze Runner. Lastly, Cooper and Collage have previously worked together on the controversial Exodus: Gods and Kings film. I think that all the writers of the film did an okay job. The story had some nice moments as well as enough of terrible ones. It has been 3 years since I read the book that this movie has been based on, so I do not remember all the tiny details, but I feel that the movie’s story was as faithful as it could be to the original material. As far as I remember, the book had more subplots and more characters, with personal aims, involved in the main events, but I am totally fine with the film cutting out half of them if that makes the plot more concise and focuses up the story. If they would have chosen to include everything from the book into the picture, we would have ended up with a whole lot of narration – basically, it would be the same as listening to the audio book. Also, the things that were in the book, but weren’t present in this film, might still appear in The Divergent Series: Ascendant. Remember, while this film doesn’t have ‘Part 1’ in its name, it still is only the first half of the final entry into the franchise. The book ending – HUGE SPOILER for the next film. I remember that I was shocked when I read it in the book and I really hope that they will keep this ending. It’s not only brave and different but a quite nice cinematic twist. This franchise would definitely earn back my respect if they did it. The whole set- up for the escape was completely different. However, while the premise and the process were altered, the final outcome stayed the same. The actual group Allegiant played a slightly different role and showed up later in the film’s story than in the book’s story. A much smaller group of already somewhat established characters participated in the escape in the film. In the book, there was an inoculation serum which was not present in the film. I don’t remember anything about the plasma balls and drones in the book. I think that the filmmakers just thought that it would a cool visual, however, it ended up being a kinda stupid idea. Lastly, I don’t think that there was such institution as the council in the book. While reading the story in the book, I didn’t really have problems with it, but watching it on screen made me realize how annoying and frustrating it sometimes was/is. For one, the death of Tori was so obvious – why would she deliberately stand further back? Also, how could Evelyn not realize that the memory serum would affect everyone? The film also had kinda an abrupt ending as it was only the first 1 of the bigger picture. Other problems I had with the film were more visual or aural. For one, that 3D exposition in the bureau was obviously meant for the viewers and not the characters. Moreover, the technology and the architecture of the place wasn’t even remotely realistic. Lastly, all the screams, especially in that aircraft, sounded really fake. Okay, I feel like I have been too harsh on this film, so I will tell you 2 things that I actually enjoyed about the story. Number 1: I liked the idea that old methods in new circumstances will equal to the same mistakes and Number 2: I enjoyed the fact that they didn’t portray David as a straight up villain. He was kinda right in saying that peace is impossible to achieve without the struggle. Insurgent’s director Robert Schwentke returned to direct the 3rd film. To my mind, he did a good job. I noticed that he used a lot of overhead panning out shots as well as the circle/around traveling shots. The short fight on the plane was probably my favorite action sequence, just because it was the most realistic. The CGI of the film was also okay – nothing too groundbreaking but nothing bad as well. I really loved the mise-en-scene of the film. That includes the brown/orange/red/yellow wasteland as the setting and the soldiers’ costumes which changed colours (red outdoors, grey and black inside). I also have to praise the editing department for the opening sequence – I liked the futurist and pixelated font in the old school color of gold. It was a nice juxtaposition between tradition and modernity. Allegiant’s soundtrack was put together by Joseph Trapanese. I especially liked his pick for the main theme/end credits song – Scars by Tove Lo. Since I’m a fan of Lo, I have been listening to this track even before I watched the movie – I highly recommend you give it a listen even if you don’t plan on watching the film. As with all YA movies, the cast consisted of young up-and-coming actors and older more accomplished ones. The ‘youngsters’ were led by Shailene Woodley as Tris. She was good in the action scenes as well as in more challenging dramatic ones. Still, my favorite movie of hers will always be TFIOS. She will be starring in Snowden – a political thriller later this year. Theo James starred as Four, the love interest. He was perfectly fine in the role and is currently working on another Underworld film. Ansel Elgort played Caleb, while Zoë Kravitz starred as Christina. Both of them had really tiny roles, but I quite liked their funny moment together in that aircraft. I am really interested in Elgort’s next project – the movie Billionaire Boys Club. Kravitz doesn’t really have any big movies coming up, but you can always rewatch Mad Max Fury Road if you want to see a really good movie of hers. Miles Teller as Peter. I really hated the character of Peter in the book, but I loved him in the film, probably because Teller was playing him. I am a fan of his and would like to forget the disaster of Fantastic Four as quickly as possible. Teller as Peter had basically all the funny lines and one-liners of the film. Next, we will see Miles in the comedy Get a Job and in 3 other films later this year. The adult cast of the film consisted of Jeff Daniels as David, Naomi Watts as Evelyn, and Octavia Spencer as Johanna. I feel like, for them, this movie was/is the definition of a paycheck gig. All in all, Allegiant was an okay film. I didn’t expect much from it to be truthful, so I wasn’t that disappointed. It’s not a must-see, but if you have nothing better to watch or do, you will have a pleasant time watching Allegiant. 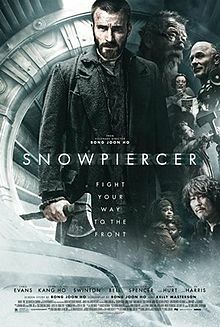 I have just watched the movie called Snowpiercer and this is going to be my review. The main reason why I picked this particular movie was because I wanted to see what Chris Evans can do outside his Captain America character. However, other cast members sparked my interest as well: Octavia Spencer and Tilda Swinton both are in this movie. Short summary: In 2014 people were trying to stop global warning with CW7 experiment and, as a result, they froze the whole Earth. Survivors of the human race moved to the train called Snowpiercer which was built by Wilford (the keeper of the eternal engine that runs the whole train).The train is divided to sections: poor people live at the tail of the train while rich people are enjoying the good life at the front. The movie follows the story of Curtis Everett – a revolutionist who tries to lead the poor to the front of the train. First of all, isn’t it ironic that we always thought that the end of the Earth would be when the sun explodes and we all burn with it and, in this film, instead of burning we all freeze to death? Snowpierer is an epic piece of art. It has a blockbuster qualities as well as deep meaning. This is a kind of science fiction film that makes my nerd heart fly. I cannot wrap my head around the fact that this movie did not have a worldwide release. It premiered on August 1st, 2013 in South Korea (its home country), when in several movie festivals during September through June and it finally got its release in the US on June 27th (in limited amount of theaters). I believe that this movie should get a global release and even an Oscar nomination. You may ask why? Let me show you: (You might find some spoilers ahead). 1. The movie has a global feeling: It is a South Korean-American movie based on a French graphic novel about the train that goes around the world. One circle of the train is equal to one year. 2. It has a dystopian vibe which is so popular right now. 3. It shows the reality of human violence. When our race is on a brink of extinction we don’t care about each other – we just want to live and this movie portrays every aspect of human selfishness vividly. The movie is definitely not for people with weak nerves: it has a lot of blood in it. 4. The character of Curtis is well-developed. Chris Evans portrays this damaged character amazingly. You feel sorry for him and at the same time you have an emotional connection with him. 5. The premise of the movie and the overall storyline is fresh, new, exciting and interesting. 6. The action is realistic and CGI effects are worth the applause. 7. The movie deals with problems such as: revenge, betrayal, drug abuse, sacrifice, friendship, fight for freedom and what is right and even cannibalism. Seems a lot? Strangely, the movie is not overcrowded and everything has its place. 8. Once again the movie shows that money rules the world and that people will always be divided by how much money they have. 9. The train, for me, had some similarities with the Noah’s ark. Both the ship and the train were striking for balance, even if it meant killing others. 10. The character of Ms.Wilford was a symbol of human insanity and what happens when we go too far. 11. Tilda Swinton does an amazing job in her role. You hate her so much for the things her character does and at first you cannot even recognize her because of all the makeup. That’s a true on-screen transformation. 12.Director Bong Joon-ho is know for movies like The Host (2006), Mother (2009). As you might guess, I loved this movie. It will probably be on my top 10 list for sure. Rate 5/5. And I am not the only one who thinks like this – Snowpiercer has a 94% rating on Rotten Tomatoes.